See what speakers for home theater made it into this customer's getaway! Looking for the best speakers for home theater? First, ignore the myth often perpetuated on the internet that there are speakers that are “best for music” and others that are “best for home theater.” The best speakers for home theater are the ones that are great with music; that is, they’re transparent and natural-sounding. Movie soundtracks are comprised of lots of music, male and female voices, and many sound “effects,” whether it’s the sound of a car door closing, rain on a roof, or a dog barking in the distance. These are all familiar sounds to our ears, as are most musical instruments, so speakers that are true and natural with music will do equally well with voices and commonplace sounds from everyday life. That said, you should know what’s required of speakers for home theater. 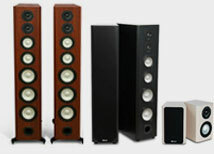 The front left and right speakers present the stereo left-to-right “soundstage” – the sonic panorama pictured on-screen. The center speaker, located above or below the video display between the front left and right speakers, carries most of the actors’ voices and dialogue. The center as well as the front left and right speakers must be natural sounding and from the same manufacturer so the tonal blend across the front soundstage is seamless and natural. Mixing different brands of speakers is not advisable. The surround speakers are usually smaller and go to each side of the room. They’re largely for ambience and effects—the sound of rain, wind or ricocheting bullets in thrillers as well as off-screen sounds. Two more surround speakers may also be placed on the rear wall in addition to the surrounds on each side wall. 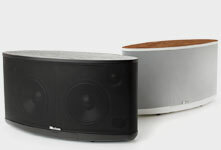 Finally, a subwoofer is a speaker with a large “woofer” for deep bass, and an internal amplifier to power it. 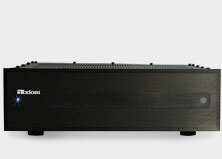 It can be located in a corner or at the side of a room, as deep bass tones are not directional. As with hi-fi speakers, the best speakers for home theater are from companies that make only speakers, not a variety of electronics such as TV sets, receivers, and DVD/Blu-ray players. Looking for inspiration for your room? Check out our Wall'O'Fame with lots of home theater pictures like the one above, or call our toll-free number to get free expert advice you can trust - 1-866-244-8796. We're always happy to help! Gourmet popcorn is the latest hot food trend, and with good reason. Nothing is easier to flavor and the choices are endless. We're stationed in the anechoic chamber again, looking at Axiom's latest amplifiers, the ADA series. Axiom's Engineer Andrew Welker takes us through a few of the inner workings of the ADA amplifier, and what sets them apart from the rest of the amps on the market today. Axiom Engineer Andrew Welker continues with his description of how to design an in-wall loudspeakers to avoid any problems with reflections and diffractions1. One question that several of you have asked pertains to designing an in-wall speaker: how does it differ from designing a regular speaker? What factors do you have to take into account when you're engineering it? I caught up with Andrew Welker in our anechoic chamber (this time we put the floor in so I could turn the camera around!) and asked him about his strategy. Remember the first time you heard a hot home speaker setup - the kind that had you actually flinching as special surround sound effects went off beside and behind you? The thrill, the excitement of a superior surround setup - that's why we all got into this hobby, right? If it's been a while since you felt that excitement, here are five tips for getting the magic back. The latest home theater speaker system at Axiom: The Epic60 600 160 Introducing the latest Axiom Home Theater Speaker System: The Epic 60 600 160. A great home movie theater expresses your personality. There's something curiously satisfying about building your own home movie theater. Recently a friend of Axiom appeared on Facebook to tell us his Axiom's were still going strong, 6 years after they first made the flight to Indonesia. Home Surround Sound vs Movie Surround Sound: What's the Difference? 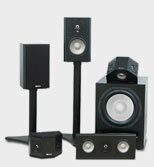 What are the differences and the similarities between home surround sound and movie surround sound systems? 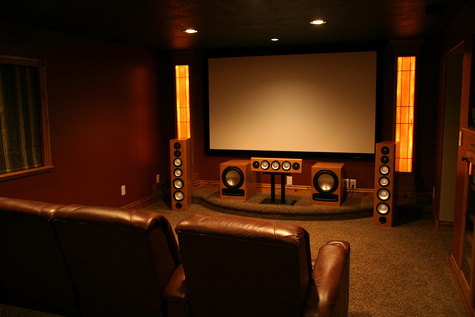 In the way both systems work, the goals of each are essentially identical—to provide a big stereo soundstage at the front, with a dedicated center channel speaker in the middle that anchors the actors’ dialogue at the movie screen or video display, and at least two or more surround speakers at the sides of the theater (or your room at home), with the option of two additional surrounds on the back wall. The Quest For The Best Home Speakers: What Should You Look For? Small speakers are best suited to smaller rooms; large open rooms and great rooms will need much larger speakers to recreate music at natural, loud, undistorted listening levels.